The YI Horizon VR180 camera gives users an easy way to capture high-resolution, immersive video. It seamlessly integrates with YouTube and Google Photos so viewers can easily activate a VR experience when viewed with Google Cardboard, Daydream, PSVR, and a number of other certified VR viewers. the YI Horizon VR180 Camera captures 3D video in 5.7K resolution at 30 frames per second (fps). 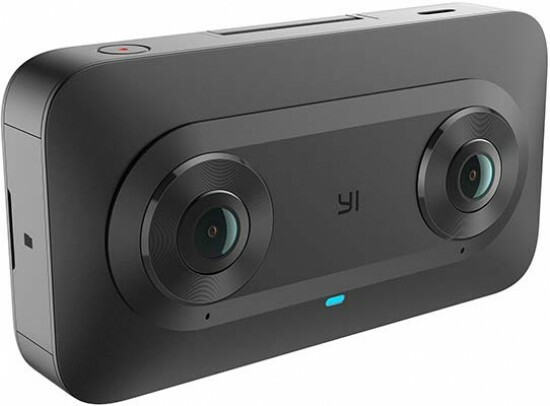 LAS VEGAS--(BUSINESS WIRE)--CES – YI Technology (YI), the leading provider of advanced, intelligent imaging technologies, in collaboration with Google’s Virtual Reality (VR) team, announced details of its YI Horizon VR180 Camera. Developed to leverage Google’s new VR180 format, the stereoscopic, 3-D camera gives users an easy way to capture high-resolution, immersive video that lets anyone who views it immediately transport to new and amazing places. YI Horizon VR180 seamlessly integrates with YouTube and Google Photos so viewers can easily activate a VR experience when viewed with Google Cardboard, Daydream, PSVR, and a number of other certified VR viewers. Viewers can also easily view the content in 2D. With an intuitive and sleek design, the YI Horizon VR180 Camera captures 3D video in 5.7K resolution at 30 frames per second (fps) and video looks great on desktop or mobile. The camera also features instant in-device stitching and supports live streaming so creators and fans can be together in real time. To learn more, please visit www.yitechnology.com/180-vr-camera, and to learn more about YI Technology’s other VR offerings go to yitechnology.com/yi-360-vr-camera and yitechnology.com/yi-halo-vr-camera. To learn more about Daydream’s VR180 program visit vr.google.com/vr180. YI Technology is a leading, international provider of advanced, intelligent imaging technologies, products, services and platforms. Its development team consists of industry-leading experts from the US, China, Japan, Israel and Europe with several decades of combined experience in imaging technology, algorithms, data analysis, cloud computing and mobile applications. YI is committed to using innovative technology to make everyday life safer, richer and more fun. For more information visit www.yitechnology.com.